Another day, another monopoly variation. 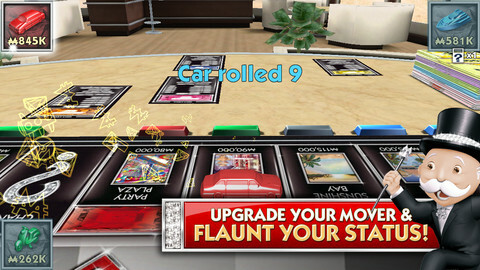 This time, it is Monopoly Millionaire, based on the recently released board game of the same name. As the name alludes to, the first player to a million dollars wins. The board has shrunk, meaning fewer properties available and after a few decidedly shorter trips around the board, most of the properties will have been bought or auctioned off. As you go past Go, you can upgrade your piece (your little boat will become more of a ship) enabling larger rewards but also larger losses. Due to the frenetic nature of the game, trading has been given less prominence. There will be many less trades in the game and it is much easier to reach a million than it is to bankrupt someone in the original. Gone are also the Community Chest cards replaced by Fortune cards and Milionaire cards. 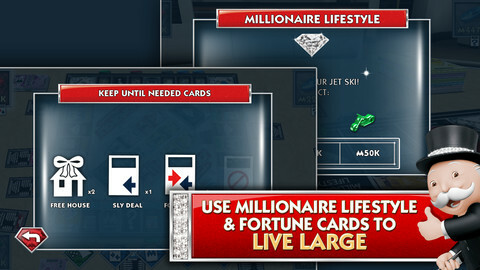 Some Fortune cards are Keep until Needed or in other words, can be held and used later on - allowing you to buy houses, get out of jail free and to steal property from other players. No longer will there be those frustrating games that no player trades - with these cards in play, you can just steal what you want! A typical game will last around 10 minutes. The usual game setup options are there : different number of CPU and human players, pass and play and wifi modes and different AI levels. The board is viewed top down, zoomed up when the player races down the board. The interface is well designed, uncluttered and clear making the learning curve not particularly steep. This Monopoly variant although much quicker lacks the depth of the original, instead relying on a large amount of randomness in the form of cards that shift the balance unevenly towards the fortunate players who manage to pick them up. 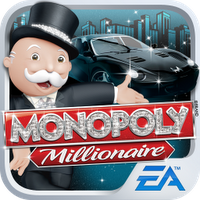 It does give an adequate Monopoly fix but leaves the player ultimately unsatisfied.